Every year we feel the need to add a new flavor to our line of olive oils. Eventually we will need to start dropping some but at the end of the year when we look at sales between every flavor they are all within a couple hundred bottles of each other so it is tough to decide which ones to eliminate. As soon as we start thinking we will discontinue one flavor it will get featured in a magazine or we will get a lot of positive feedback on it and we end up deciding to make it again. Once again this year; we decided to add three new flavors. Our number one most requested flavor for the past few years has been blood orange so we decided to take the plunge and finally give it a run. What a wonderful olive oil! We sourced our citrus from Southern California and without knowing what to expect this oil turned out fabulous. Very aromatic with a huge burst of orange flavor. We recommend using our Blood Orange Olive Oil on seafood, salads, over vegetables for roasting or in baking. We recently used it in a batch of chocolate brownies and the result was to die for! Our next addition is our white truffle olive oil. We have been making truffle oil for a company on the East coast for years and this year we decided to finally bottle some up for ourselves. Our truffle oil is the only oil we don’t make by crushing the produce together with the olives. Mainly this is because white truffles are outrageous in price and the process would be a total waste of truffle and result in a bottle of oil nobody could afford. The other reason is there isn’t many natural oils in truffles (or tubers) so the process in which we extract the oil wouldn’t We wanted to keep in line with our mentality of only using fresh produce to create naturally made and natural tasting oils so we create this oil by sourcing premium fresh white truffles from Le Marche Italy. Through a proprietary process of creating a highly concentrated small batch of oil I am able to blend back to make a wonderful real white truffle extra virgin olive oil. There are a lot of fakes out on the market. If you are buying a white truffle olive oil for under $10/bottle I guarantee you it is either really old and discontinued or it isn’t the real thing. This is a decadent oil; a little goes a long way. Try it on potatoes, risotto, pizza or my favorite is over air popped popcorn. The last oil we made is one I don’t believe has ever been made before. Sound familiar? I’m pretty sure we were the first ones to crush fresh Buddha’s Hand Citron with olives and now we are the first to bring you Vanilla! We go to the New York Fancy Food show every year and it is always interesting to meet the companies who have booths next to yours. This year we were right next to a vanilla company with sustainable farms in Madagascar. I was very interested in hearing how vanilla beans are grown and cured. It is a very time consuming and labor intensive process which explains why they cost so much! 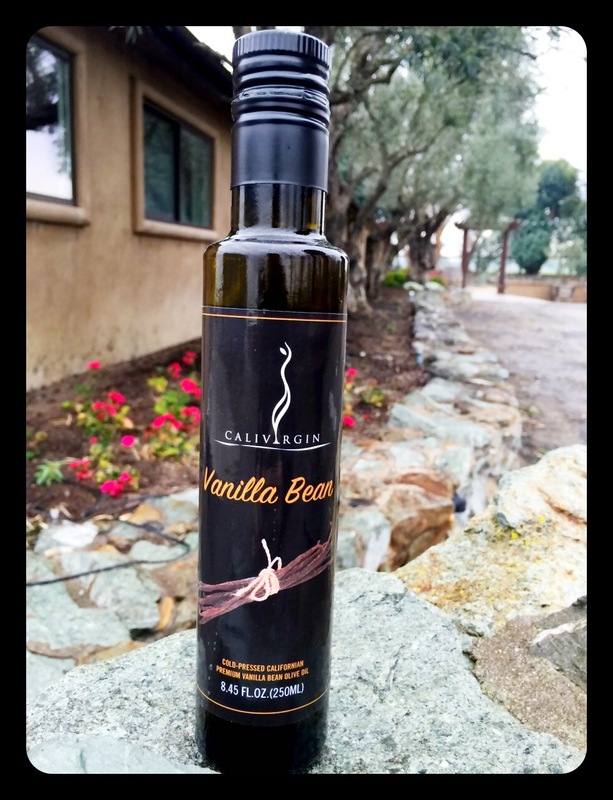 I only wanted the best for our oil so we purchased numerous pounds of their premium A-1 grade vanilla beans and crushed them together with our early harvest green arbequina olives. I had no idea what to expect. It could have been a small financial blunder and a waste of great olives if the oil didn’t turn out well. Fortunately it was a success and I am very excited to see how this oil does this season with consumers and in competitions. You can get creative with this oil. Use it to finish the next pair of delicate lobster tails you prepare. Replace butter with this oil in any baking recipe or try adding it to your next pan of rustic cornbread to add an interesting twist.